Residents felt that the provision of information was mainly good or reasonable. Communication has come through strongly as being an important factor which can affect all aspects of village life. At present there is a Parish Council notice board at the entrance to the Park and one at the entrance to Manse Way. Both the Baptist Church and the Village Hall has its own notice board. 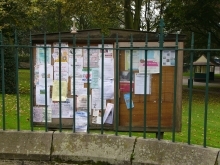 Another notice board is situated near the old toilet block. A village newsletter is produced and circulated by the Village Committee four times a year containing village articles, up and coming events and local advertisements. The main methods of communication are posters in shops and articles and adverts in the Keighley News and Craven Herald. Communication is of primary importance in involving the residents in the activities and life of the village.